Designed to meet the needs of the caregiver as well as the patient. 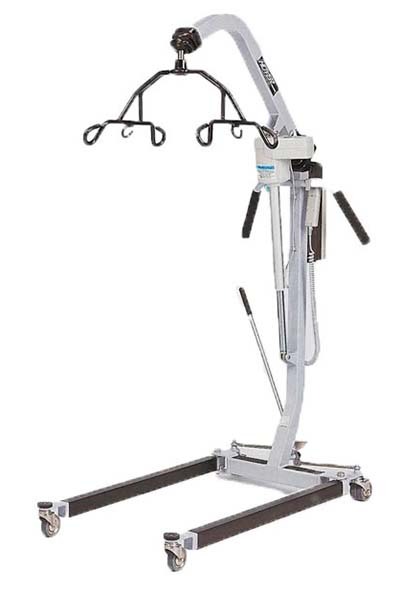 Caregivers and patients like the Powerlift 500 Classic Lift because of the spread on the sling cradle. In simple terms, the hooks are spread out so they don't pinch the patient. 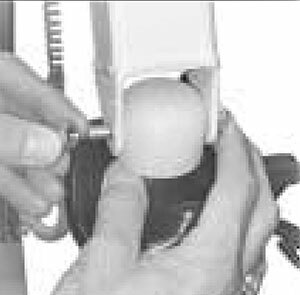 This type of spreader allows use of a greater variety of slings. The Powerlift 500 Classic Lift features ergonomic handle grips to reduce back strain and a mechanical down-release lever for non-powered lowering. 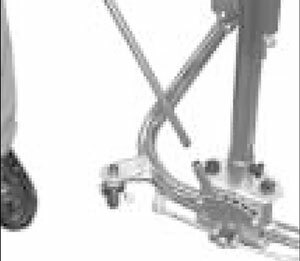 The single-speed actuator is reverse-mounted to give the patient increased leg clearance, and the unit also features leg guards and caster bumpers to prevent damage to walls and furniture. The Powerlift 500 Classic Lift has a low base that needs only 5.5" clearance. This makes it easy to roll under a bed or chair. The 6-point cradle insures you'll be able to use a variety of 4- and 6-point slings. The hand control activates the lifter and has two buttons; one “up” and one “down”. Simply press the button for the direction you want the lifter to move. Plug the charger into the wall socket (110 V) prior to connecting the plug to the control box. If the unit sits idle for an extended period of time, the battery life diminishes. A control box with battery should be charged at least every six months. However, the longest life is obtained when the battery is fully charged. After approximately 6 hours of charging, the batteries will be fully charged. thin layer of grease should be applied to all bolts. 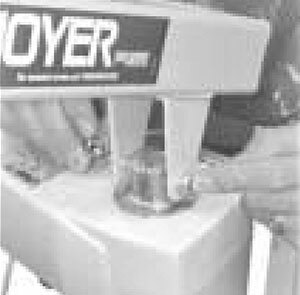 Carefully unpack Hoyer Lifter. Check for 6-point cradle and adjusting lever handle. Insert mast in base and tighten bolt. Make certain boom points in same direction as base legs. Thread mast safety lock and stud into threaded hole in mast sleeve. Tighten firmly, locking mast into base. 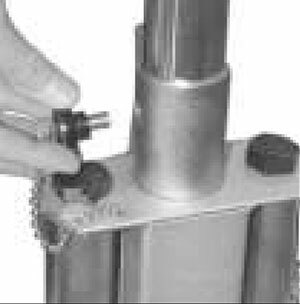 Keep mast and base locked at all times except when removing mast from base for storage. Attach the actuator to the mast and the motor end to the boom with hardware. 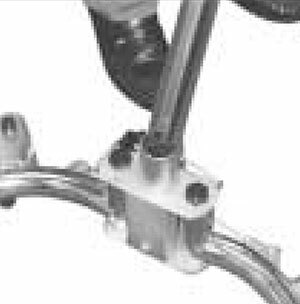 Remove nut and bolt from cradle. Hold cradle in position at the end of the boom and align the holes of the pin and cap with the holes in the boom end fork. Swivel cradle to check for free movement. 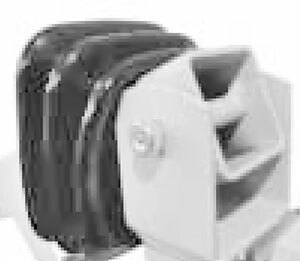 Pull vinyl boot over connection, making sure middle rib is over hardware). Attach the power unit control box to bracket on back of mast. Attach battery pack to control box and bracket. Route actuator cable along mast and secure with clips provided. Make sure to leave approximately 8 inches of cable prior to the top clip to allow for maximum lifter articulation). Plug the charger into the wall socket (110 V) prior to connecting the plug to the control box. If the unit sits idle for an extended period of time, the battery life diminishes. A control box with battery. should be charged at least every six months. However, the longest life is obtained when the battery is fully charged. After approximately 6 hours of charging, the batteries will be fully charged. NOTE– It is not possible to overcharge batteries. (Battery is a Gel Cell). NOTE– Battery alarm will go off when battery is low. The duty cycle printed on the label of the control box must always be noted. If this is exceeded, the control box could overheat and become damaged. 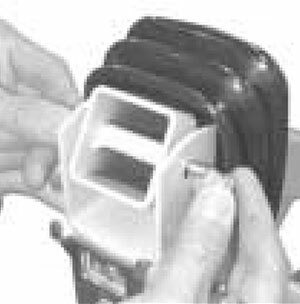 Unless otherwise specified on the label, the duty cycle maximum is 10% or 6 min/hour of continuous operation. To widen or narrow the base, pull adjustment handle back to unlock. Handle can be moved to the right to widen the base or to the left to narrow the base.